Emma and Patrick, two medical professionals, recently joined our country manager, Jimmy Lama, on a trek through the Helambu region in which MondoChallenge Foundation and the Helambu Education and Livelihoods Partnership are working to re-build schools following the earthquakes and enhance education. If you’ve missed it, catch up on Part 1, Part 2 and Part 3 of their story. 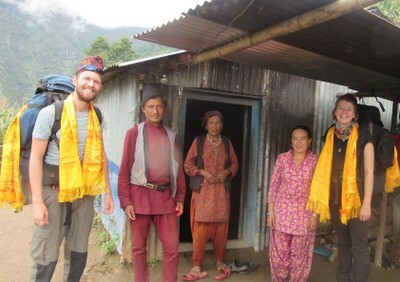 Ichowk was the largest village we had visited, and we were glad to arrive at the home of our host-teacher, Aiti Tamang, where she lived with her “muma” (confusingly, Tamang for grandmother), where we dried off and were served dinner. We loved staying here, with immaculate views down the valley from our front door, excellent food, comfortable beds, a clean bathroom, and always friendly faces as Aiti’s huge family came and went throughout each day. After Jimmy left to continue his school visits, our time here was spent teaching in the TLCs. The new school building is still in its planning stage, so the 400+ children here may be in these temporary classrooms for a while longer! Although not ideal, they are noisy and crowded, they are infinitely better than the old building, which was almost entirely destroyed last year. We aren’t teachers by background, but loved the opportunity to use our own skills to teach the children important lessons. 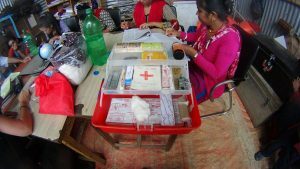 We ran first-aid classes; first, the basics of wound-care for the whole school in the dusty playground in the sun, then some more advanced techniques for the older pupils and teachers, all of whom were keen to learn, ask questions, and practise dressing burns or bandaging snake-bites. We also did some more general health-care teaching, particularly a very fun workshop in which Emma, with materials we carried with us from Kathmandu, made sanitary pads with the older girls. Up here, the luxuries women are used to in more developed areas are not available, and we, as medical professionals, have seen women quite unwell from the dirty rags often used during menstruation. We spent our three evenings here planning the next day’s teaching, sometimes outside our house overlooking the cloudy valley, or inside in the dark of one of the frequent powercuts, hiding from the torrential monsoon rain. It was by torchlight on one of these evenings that we prepared a first-aid manual, and put together a first-aid kit for the school, building on the rather sad one that was already here, from some simple medicines and dressings we had brought with us. Health-care in Ichowk is hard to come by as the closest clinic is over an hours walk away and so we felt it really benefitted the children and teachers to have awareness of the basics to they can treat the trivial problems themselves and know when it is important to seek help. We were sad to leave Aiti and her family when the time came. Her uncle walked us down to Chanauti Bazar, the town the hourly bus goes from, to take us back to Kathmandu. The walk was relaxed and fairly easy having had two days rest after our tiring walk on the way there, but the bouncy bus journey itself was a five-hour exercise in balance and abdominal strength! It was incredible to see the work that HELP and Mondo are undertaking in this area, and a privilege to be able to play a small part in it. Massive thanks to Jimmy Lama for taking us on this all-too-short adventure through this breathtakingly beautiful region of Nepal.